Born in Istanbul, Cihat Askın started his violin lessons at the age of 11 with Prof. Ayhan Turan, at the Turkish Music State Conservatory of Istanbul Technical University, graduating in 1989. 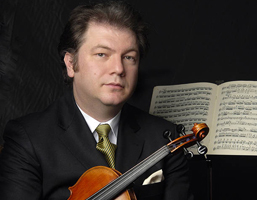 He completed his studies in London, studying under Rodney Friend at the Royal College of Music (where he took all the major solo and chamber music awards), and Yfrah Neaman at City University (1992-96, doctorate programme).Upon his arrival in Istanbul he was appointed as a violin professor in 1998 and founded the Advanced Music Research Center (MIAM) and became its first director in 2000 and appointed as an academic Professor in 2006 at ITU. He gave his first recital at the age of 12 and was able to play all Paganini Caprices before he was 15. After his recital in 1983 he was invited by the Istanbul State Symphony Orchestra to play Tchaikovsky’s Violin Concerto. Since then Cihat Askin became a prominent figure in the music life and he has been a regular soloist for all the major orchestras of Turkey. He has been invited to give recitals all through Turkey,and made tours as concertist and recitalist to Europe, Asia, Africa, and the USA. Askin has appeared with violinist Shlomo Mintz and Ida Haendel, conductors such as J.L.Cobos, Yoel Levi and Alexander Dimitriev and orchestras such as Lausanne Chamber, Hannover NDR Symphony, Dusseldorf Philharmonic,Prag Symphony,Ukraine National Philharmonic and Sofia Philharmonic Orchestra. He was also invited to International Festivals in Turkey, Spain, Belgium, UK, Hungary, Bulgaria, Tunisia, and Holland. Among his many prizes may be mentioned, the Istanbul Philharmonic Society Award, The Best Bartók interpreter at the 1987 Yehudi Menuhin International Violin Competition, Outstanding Merit Prize at the 1990 London Carl Flesch International Violin Competition and Foyer des Artistes (Italy, 2002). A noted champion and broadcaster of modern Turkish music, Cihat Askin has recorded extensively for Hungaroton, Kalan Müzik, Discovery, Meridian, CPO and UPR Classics, releases including Mozart’s Fifth Violin Concerto . His album (Invitation to the Seraglio /Emre Aracı) was released from Warner Classics. He recently released the first integral recording of Kreutzer 42 etudes and highly acclaimed by the ciritics. Cihat Askın has been invited as a violin teacher to Keshet Eilon Violin Masterclasses in Israel where he teaches as a faculty member since 1999. He served as a jury member in many international competitions in Sofia, Poland, Tel Aviv and Sion. Apart from being a performer Askin composes pieces for violin and various instruments. His transcriptions for violin and piano are published by Pan Edition of Istanbul. Askın became the founder and music director of the Istanbul Chamber Orchestra between 2001 and 2006 and was the founder of the Istanbul Modern Music Ensemble (IMME). He also established an educational project called CAKA ‘Cihat Askin and Little Friends’ which develops the violin education throughout Turkey. He recently established the ‘Askin Ensemble’ which performs variety of music from chamber works to experimental Turkish music. 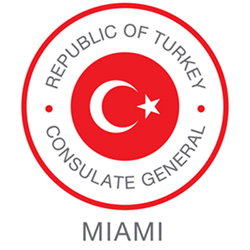 Cihat Askin’s participation is co-sponsored by the Turkish Airlines, Turkish Consulate General in Miami, and FIU Mohsin & Fauzia Jaffer Center for Muslim World Studies.